November 4, 2013 – Gov. Nathan Deal announced today that Georgia’s business climate has been named No. 1 in the nation by Site Selection magazine, one of the nation’s top economic development trade publications. 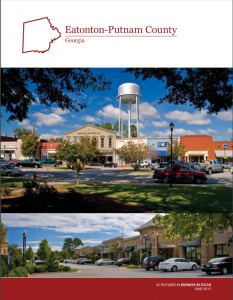 ” The magazine releases its annual rankings each November, bases its research partially on a survey of corporate real estate executives and in part by an index of tax burden criteria according to the Tax Foundation and KPMG’s Location Matters analysis and the states’ performance in Conway Data’s New Plant Database, which tracks new and expanded business facility activity. Georgia has ranked among the top 10 states in Site Selection’s business climate rankings over the last 10 years, and moves up from No. 4 last year. The Peach State makes frequent appearances on national “Top 10” lists for business, including No. 2 in Area Development’s 2013 rankings and No. 8 in CNBC’s annual rankings. Site Selection magazine, published by Conway Data Inc., delivers expansion planning information to 49,000 executives of fast-growing firms. The senior publication in the development field, Site Selection is also available via Site Selection Online (www.siteselection.com). The publication also publishes or co-publishes e-newsletters, including The Site Selection Dispatch, Life Sciences Report, Aerospace Report and Energy Report; Site Selection International; The FDI Report; Trust Belt.com and the OnSITE Travel blog. Conway Data is an international publishing, consulting and association management company headquartered in Atlanta. It is also a fast-growing firm, having more than doubled in size over the past two years. Conway also owns and manages London-based Red Hot Locations, organizer of world-wide FDI events; Berlin-based FDI advisory firm Terrain Consulting; New York-based The PONT Group, a leading PR and lead-generation firm; economic development education and research organization the Janus Institute; and manages the Industrial Asset Management Council and the forthcoming FDI Association, launching in November 2013.